Medical Matters, USMST Making News! 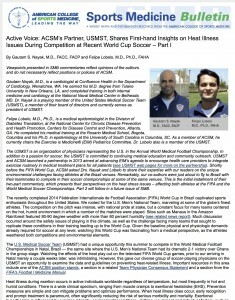 Gautam Nayak and Felipe Lobelo recently wrote a two part series on heat injury for the American College of Sports Medicine “Active Voices” online publication. They reviewed the data and discussed the experience of USMST in Natal, Brazil during the 2014 World Medical Football Championships. Click here for Part 1 and for Part 2.